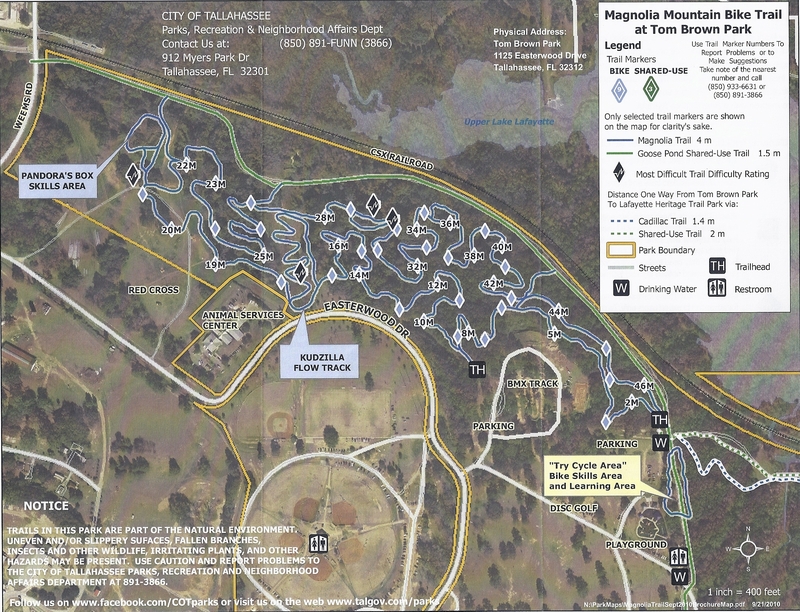 This is the map of Magnolia Trail at Tom Brown Park, provided by the City of Tallahassee (flyers available at trailheads). This is a scan of the map of Magnolia Trail at Tom Brown Park. Physical copies are available at the trailheads (most of the time), but we thought it might be handy to have one on-line for you smarty phone users. Magnolia is equal parts flowy and technical, with several built-in obstacles (WALLRIDE!). More difficult than Munson Hills, but not as rooty or technical as Red Bug or Cadillac. This entry was posted in Where to Ride and tagged Magnolia Trail, Munson Hills, Tallahassee Mountain Biking, Tom Brown Park. Bookmark the permalink.